DeSean Jackson vs. John Brown: Who would you rather have? Question form Eagles in NC: Any thoughts on acquiring DeSean Jackson as opposed to the younger John Brown? Did compensatory picks play a role? The comparison of Jackson and Brown is interesting because they both signed three-year deals worth $27 million (though they are structured differently). On the field, both players possess outstanding speed, but Jackson's career has been far superior. He is perhaps the most prolific deep threat in the history of the NFL. And really, no matter how you slice Jackson's and Brown's numbers – last year, last two years, last three years, last four years, overall career, whatever – Jackson’s are better. In 2018, Jackson played 12 games. Had he played in all 16, he was on pace for 1,032 yards. If you'd like to make the argument that he's prone to missing a few games each season, that's fair, but it's also (somewhat) true of Brown. As for age, Jackson will turn 32. He'll turn 33 in December. Brown is 28, but will turn 29 in a couple weeks. Brown is roughly 3.5 years younger. It's not as if he is some sort of up-and-comer with an untapped ceiling. He's a year and a couple weeks from turning 30. So the question then becomes, will Jackson's skills suddenly fall off a cliff over the next, oh, let's say two years? If you think the answer is yes, then perhaps Brown would have been the better signing. If you think Jackson still has wheels (as he showed in 2018), then I'll take the better player, which is very clearly Jackson. In the Eagles' offense, what they lacked most last season was a player who could stretch the field. Over Brown's five year career, he has 13 receptions of 40-plus yards. Jackson has more than double that (28) over that same span, and an absurd 63 for his career. While Brown is fast, he doesn't have the same clout as Jackson, who will strike fear into opposing defenses. The mere presence of Jackson will force opposing safeties to keep a watchful eye on getting beaten over the top. That didn't exist in 2018, and it showed. With Jackson on the field, watch as the short to intermediate areas of the field open up for guys like Alshon Jeffery and Zach Ertz. To your last point about compensatory picks, the Eagles traded almost nothing to acquire Jackson. Had they signed Brown, he would have canceled out one of the fourth-round picks the Eagles are projected to receive for the losses of Jordan Hicks or Golden Tate. I think the Eagles aggressively pursued Jackson because he was the best deep threat available. The comp pick angle is just an added bonus. Question from Turd Ferguson: How would you rank the teams in the division going into the draft? Eagles: Best QB, head coach, and GM in the division, by far, and a really good roster otherwise. Cowboys: Some nice, young pieces. Sustainability of good injury luck a season ago would be a concern if I were them. Giants: Bottom 5 team. Got rid of their best player on offense, and three best players on defense. Question from DB: Do you think Timmy Jernigan comes back? Seems like there’s no market, given his injury. He might excel in a rotational role. When free agency began, I was curious to see how much interest Jernigan would receive. So far, I haven't seen any reported interest from any other teams around the league. To begin, both Jernigan and the Eagles opted not to be forthcoming about how Jernigan injured his back in the first place. Teams around the league will surely want to know what happened before they pay him millions, so it's possible the circumstances of his injury raised red flags. Beyond that, Jernigan is a 300-pound man coming off back surgery. That has undoubtedly scared teams off. If Jernigan doesn't find any interest around the league, it would make sense for the Eagles to bring him back on a very cheap "prove it" deal. As a rotational guy who plays 15 or so snaps per game, he could be a disruptive player. The Eagles would just have to be careful relying on too many injury-risk players, seeing as injuries were ultimately too much to overcome a season ago. Question from Joe: I feel like Josh Jacobs and David Montgomery are head and shoulders above the rest of the running back class. Those are the only two with the passing game chops I trust to be three-down backs. Think the Eagles draft one of those two guys? Yes, I do think the Eagles could take a running back on Day 1 or Day 2 of the draft, with Day 2 more likely, and I think either player would be a good fit. I did want to answer this question to point you all in the direction of this highly enjoyable read about this running back class, by Thor Nystrom. It's way better than anything I'll write here. Question from SnailWhale: Will Mack Hollins be a restricted free agent like Sidney Jones because they both (essentially) missed full seasons? No. Jones’ torn Achilles at his pro day was labeled a “non-football injury,” at least in terms of NFL language. As a result, because he did not appear in at least six regular season games in 2017, he did not earn an “accrued season.” Therefore, at the end of his rookie contract, he will not have the required four accrued seasons to qualify as an unrestricted free agent. He’ll have three, and will thus become a restricted free agent. Hollins’ missed season in 2018 was not due to a “non-football injury.” He earned an accrued season in 2018, and remains on schedule to become an unrestricted free agent at the conclusion of his rookie contract. Now, to note, Jones is very much getting a raw deal, in my opinion, and I wouldn't be surprised if he filed a grievance against the Eagles if they hold him to his RFA status in a few years, just as A.J. McCarron did with the Bengals a couple years ago, which McCarron won. Question from JPP’s Index Finger: Are you surprised Joe Douglas is still around? I thought he would have gotten some GM offers by now. There are so many terrible general managers in the NFL. Bruce Allen, who has been an unmitigated disaster for his entire nine-year tenure, still has a job. Jason Licht, who whiffed on Jameis Winston, and who traded up in the second round FOR A KICKER who ended up sucking, has a job. Steve Keim, who signed Sam Bradford for $20 million, Mike Glennon for $4 million, and traded up for Josh Rosen, all three of whom might be gone by the start of the 2019 season, kept his job. Dave Gettleman, who, well, I don't even have to get started there, has a job. There are more, but I think I've made my point. Is Joe Douglas the most qualified of potential general manager candidates? I really have no idea. That's not an area of expertise for me. Would any of those above teams be in better shape with Douglas? No question. Question from Dan: I was listening to WIP, and the host said that there is no pressure on Carson Wentz. I think there is a ton of pressure on Wentz from everyone inside and outside the locker room. Lol, what? Who said that? I feel like I don’t even need to answer this, but, uh, yeah, whether you’re Donovan McNabb, Nick Foles, Carson Wentz, or Bubby Brister, if you’re a starting quarterback for the Philadelphia Eagles, there is pressure. 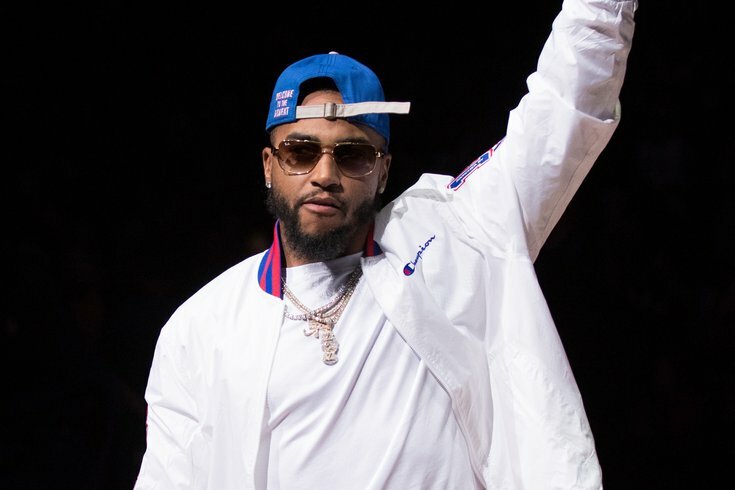 If the Eagles gave up a lot to draft you second overall, you had the last two seasons end with injury, one of which culminated with the beloved backup bringing home the franchise’s first Super Bowl win – and who is now gone despite unanimous acceptance from the city – I’d say that pressure to perform is ramped up juuuuust a tad.